With boating increasingly a year-round activity and with recreational boats being used to go further offshore, a top safety concern for boaters should be hypothermia, which can happen by falling overboard or jumping in for a refreshing dip into cold water. From Waterwise by Doug King in Vol 33.3 June/July, 2018, Club Marine Magazine. Basically, hypothermia is a medical emergency that can occur when the body loses heat faster than it can produce it, causing a dangerously low body temperature. If a person falls into cold water, or jumps in thinking the water is warm enough, hypothermia will set in if they can’t get out of the water soon enough. Cold water carries heat away from the body 25 times faster than air of the same temperature. Water of a temperature below 21°C should be treated with caution, with water below 25°C able to affect breathing – and the colder water gets, the more dangerous it is to human life. When the body core temperature is reduced to 30°C, shivering stops and muscle coordination becomes difficult. Judgement becomes adversely affected and the inability to comprehend situations, combined with irrational behaviour, is common. Pulse and breathing slow down and the person loses consciousness. Canadian scientist Dr Gordon Giesbrecht, of the University of Manitoba, is a leader in the field of hypothermia. He has devised a simple way to remember the three phases of cold water immersion and the time you have to take remedial action, called 1-10-1 – 1 minute to get control of your breathing (cold shock), 10 minutes of meaningful movement (before cold incapacitation), and 1 hour before becoming unconscious due to hypothermia. Combined, these actions can trigger cardiac arrest in susceptible individuals, while healthy persons may have difficulty keeping their head above water. Cold shock reactions peak within a minute or so and stabilise reasonably quickly. Maximum reaction to cold shock is when the water temperature is between 10 and 15°C. The first minute after falling into cold water is critical. The key is not to panic – try to keep your head above water and remember that the initial cold shock reactions will subside. The following 10 minutes are critical – you should still have reasonable mobility during this period and should use the time to take stock of your situation. In the meantime, effective use of fingers, arms and legs is gradually lost. 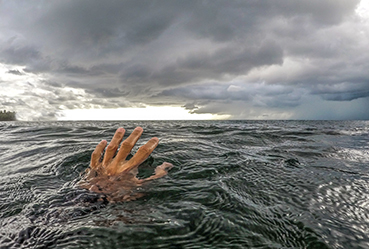 Swim failure will occur eventually and, without a PFD, drowning is likely. 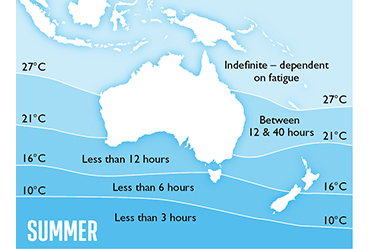 The final phase of 1-10-1 is the onset of severe hypothermia. Keep in mind that sunshine can warm water at the surface, encouraging people to leap in for a swim. However, much colder water may be just below the surface – cool streams or springs entering into lakes, cooler currents running under the surface and other factors can lead to cold water lurking just beneath the surface. 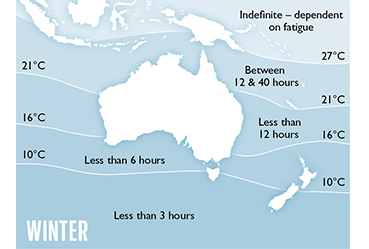 Images: Your chances of survival if not rescued dwindle the further south you go – approximate water temperatures in winter and summer. In a boating emergency, being well prepared is key to survival, and protection against hypothermia should start before foot is set on a boat. In July eNews, Part II of Cold Water Safety takes a look at ways to reduce the risk of falling overboard, how to minimise heat loss in cold water and weather, and what to do if you suspect someone is hypothermic.